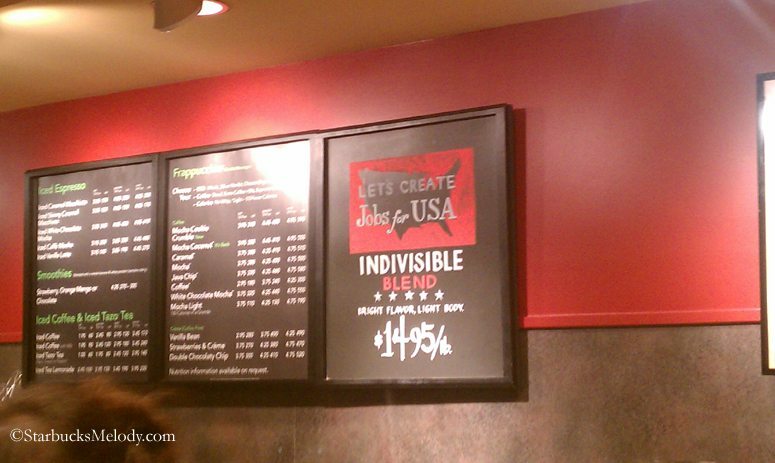 Have you seen any great #Indivisible themed art in your local stores? Readers of StarbucksMelody.com know that I enjoy featuring the amazing chalkboards that partners create for their stores. Scott, a barista in downtown Seattle, produces fantastic chalkboards for his store on the ground floor of an office tower. And, I hear that some of the stores adjacent to him also borrow him for his great talent. 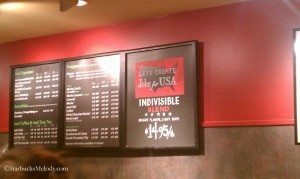 I saw this “Indivisible” chalkboard, and loved it. Here’s the whole category of chalkboard art on this blog, and about seven months ago, I featured Scott’s art here. Meet Tazo Citrus: Launched, April 24, 2002 - A delicious piece of Starbucks history. This Ft. Lauderdale Starbucks Knows How to Surprise and Delight! Ok Melody tell Scott that we need him here! LOL. I have not seen any chalkboard art for Indivisible or any other item – the board for the Refreshers is very sad and not at all attractive. I wish the DM, SM and RDM would get together and reintroduce this to the stores. As I have said before, at my local SB there is a partner that is eager to do chalkboard art designs but gets nowhere in getting permission to do it. Holy cow Melody! You’re writing a blog/day! (seems like) I can barely keep up. Melody – remember that a picture says a 1,000 words…. I agree with Denise – you don’t see much chalk art these days. I am not a fan of the cardboard drink cups that are used on the chalkboards. I understand why corporate distributes them (don’t have to pay someone to draw them in each store, consistency, etc. – and most likely the first one rather than anything else) but they do add something to the stores. I haven’t seen much on the Indivisible. Chalk art or otherwise. I’m not sure it struck the chord/conversation it intended. The momentum around the wrist bands seemed to be greater.